Historic & Scenic Sights and Opportunities Because of an interest in history in this region, GF will give information on various sights for free. Arrangements for a family tour package can also be provided for a small fee. A stage coach line and later "Old Number 8--Pike's Peak Ocean to Ocean Highway," the early transcontinental highway through this region, ran through Gladhour Farm. 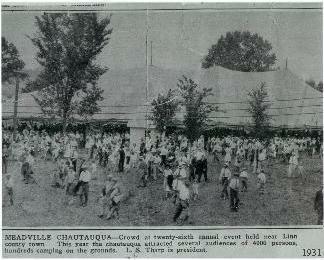 A major Chautauqua-ground was nearby. 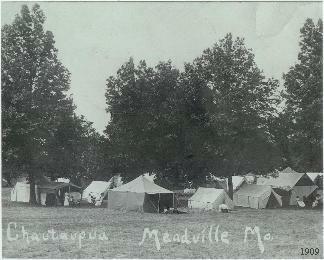 The Chautauqua movement was a wonderfully interesting concept and in a similar way, a long-term goal for Gladhour Farm includes sharing information about past times with youngsters and interested visitors. 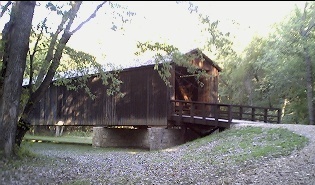 A primitive Chautauqua cabin may be available for camping for a family or couple sometime in the future. Eventually a walkway with native prairie grasses and other plant species labeled and a learning activity set for active youngsters are also envisioned. If you are coming to look at a Gladhour Farm animal and/or pick one up, why not give yourself a weekend for a mini-vacation! 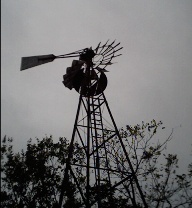 There are some interesting B & Bs and decent Super 8/other motels in the area. There is also Pershing Park nearby where you might camp. And GF will be happy to provide you with info about the sights!